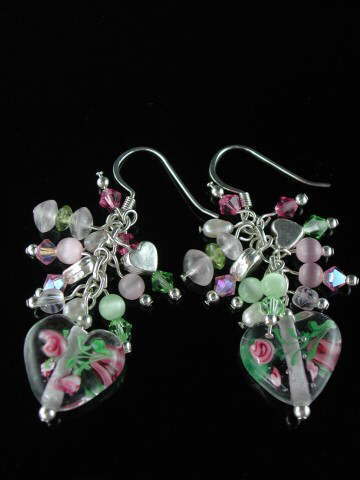 Stunning, original pink and green lampwork glass heart earrings, hand wired with Rose Quartz, Peridot, Swarovski crystals, sterling silver hearts, small pink and green Cat's Eye beads and genuine AAA grade freshwater white pearls. Made in-house exclusively for Patinkas. All findings used on these earrings are also sterling silver. Peridot; the best emotional healer combined with Rose Quartz, the stone of unconditional and romantic love - a gorgeous combination!